An old, once-prized hand tool is a sad sight when it's covered with rust. 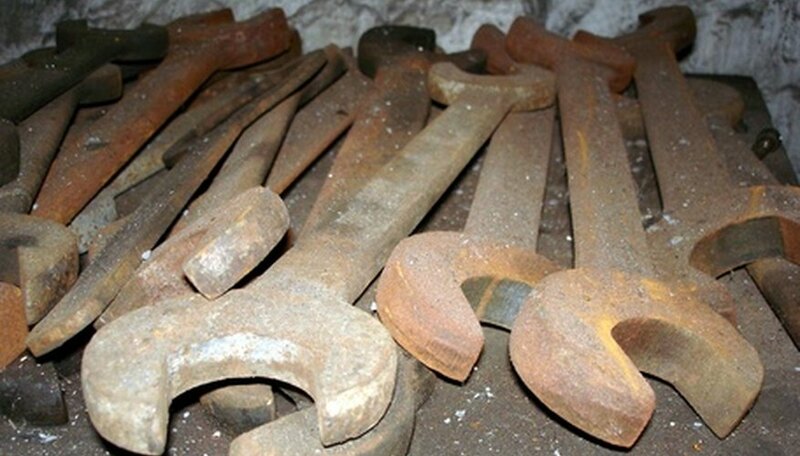 Tools that have been eaten away by rust must have their metal parts replaced by a skilled metal worker. However, if the tool is affected only by surface rust, it can be restored to a pristine and usable condition. Citric acid is a main ingredient in many household cleaners and works extremely well on rusty tools and implements. Disassemble the tool completely, separating wooden parts from metal. Don protective goggles, mask and gloves; citric acid is not harmful but can sting. Mix a solution of 1 cup of citric acid powder to 1 gallon of warm water. Place the metal components in the solution. While they're immersed, gently scrub each part with the soft brush. It should only take a few minutes for the rust to come off. Remove the parts from the citric acid solution and inspect them. Remove any remaining rust in crevices with a toothbrush. Dip the toothbrush into the solution if necessary. Dry the tool components carefully. At this stage you can protect surfaces by wiping on some protective oil or water displacement spray. Reassemble the tool and sharpen if required. You can purchase citric acid at a reasonable price from home-brewing stores in 5-lb. bags. Once made up, the citric acid solution can be used for several items before being thrown away. It's usually safe to dispose of small amounts of diluted citric acid down household drains but check with your local waste management service before doing so.